Last night during dinner we started talking about Elvis. Zoom (now 2) has been a fan for a “long time,” and tonight as he had peanut butter and bananas (The King’s favorite sandwich), Zoom chatted along with us, saying both Elvis and Elmo. 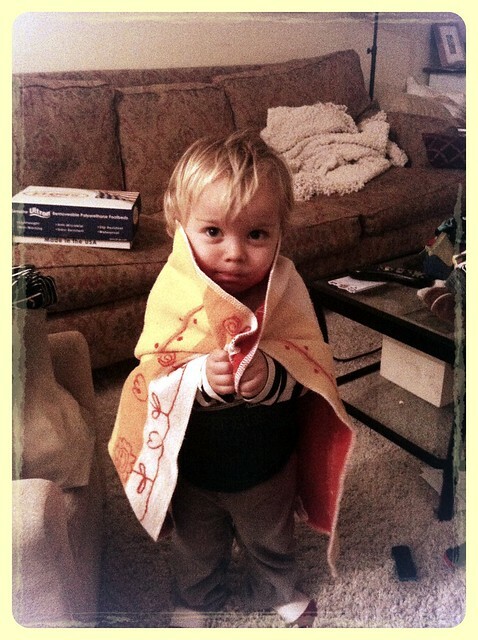 Then he jumped down from his chair and pulled a blanket over his shoulders like a cape. I like to think its because he has seen Elvis in a cape. We pulled up the footage of “Burning Love” on YouTube (from the 1973 Aloha From Hawaii Via Satellite album). And Zoom started dancing. Zoom dances a lot like my Dad. And my Dad used to play “Burning Love” off of an LP, seemingly on endless repeat when I was Zoom’s age. Our family had epic dance parties when I was growing up. I was struck by the different ways we play music, the different generations, but the love of this music, and the uncanny likeness in dance moves. Burning Love from Paula on Vimeo. Have a great weekend and Go! 49ers! That is adorable! He’s so cute!